Obesogenic nation – when will we have a strategy with teeth? Today’s report on weight-loss surgery is another warning to government on the social, economic and personal costs of obesity. It shows that about 5% of those having surgery are aged 25 years or under and 40% of them were ‘super-obese’, in other words they had a BMI of 50 or more. This is a shocking statistic that reflects the failure of everyone around that individual to provide support through their childhood into their early adult years. And whilst on average people have lost 60% of their excess weight a year after surgery, unless the root causes of over-eating are tackled, some will lose little weight whilst others around them will become obese. It is perfectly possible to have surgery and continue to eat high calorie foods and drink excess alcohol resulting in little weight loss, if the very reasons for over-eating have not been properly addressed. Whilst a psychological assessment is always made before surgery, many people need significant amounts of ongoing counselling support which currently is not provided. Our recent report Careless eating costs lives highlights the obesogenic environment in which we now live and that action at all levels – from the personal to government – is urgently needed. Added to this, rising levels of malnutrition indicate that we are not eating as we should. The Health and Social Care Information Centre (HSCIC) in August, show the number of people admitted to English and Welsh hospitals rose dramatically – from 5,469 to 6,520 – in the past year alone. There was 19-percent increase in the number of UK citizens hospitalized for malnutrition over the past twelve months. Over the last five years there was a 71 per cent increase in hospital admissions where malnutrition was a primary or secondary diagnosis, from 3,900 admissions in 2009-10 to 6,690 admissions in 2013-14. 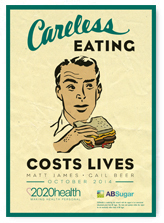 Above all we have to get serious about prevention of obesity in the first place. A national strategy on nutrition, a mandatory Responsibility Deal, local government plans, concerted action in schools and less snacking by you and me are all required. We don’t have enough surgeons for all those eligible for weight-loss surgery anyway, and as the good doctor has always said, prevention is better than cure – for the individual, society and the economy. Julia Manning is a social pioneer, writer, campaigner and commentator. Formerly a clinical optometrist specialising in diabetes and visual impairment, she is the founder and Chief Exec of 2020health, an independent, social enterprise Think Tank whose aim is to Make Health Personal and Social. 2020health has through research, events and campaigning influenced opinion and action in fields as diverse as bioethics, alcohol, emerging technologies, fraud, education, consumer technology and vaccination. In 2014, 2020health were founding partners of the Health Tech and You Awards with Axa PPP and the Design Museum, now in their 5th year. Since 2016, 2020health has increasingly focused on digital health and public health in the community through the concept of 'Whole School Wellbeing'. Julia is a Fellow of the RSA and a part-time PhD student at the UCL Interaction Centre, studying the use of digital technologies for stress management in the workplace. Julia has shared 2020health's research widely in the media (BBC News, ITV, Channel 5 News, BBC 1′s The Big Questions & Victoria Derbyshire, BBC Radio 4 Today, PM and Woman's Hour, LBC) and has taken part in debates and contributed to BBC’s Newsnight, Panorama, You and Yours and ITV’s The Week. This entry was posted in Obesity and tagged bariatric surgery, BBC, HSCIC, malnutrition, nutrition, obese, Public Health, Responsibility Deal, Surgery, weight-loss. Bookmark the permalink.